Shorts or short shots are one of the most common quality issues. 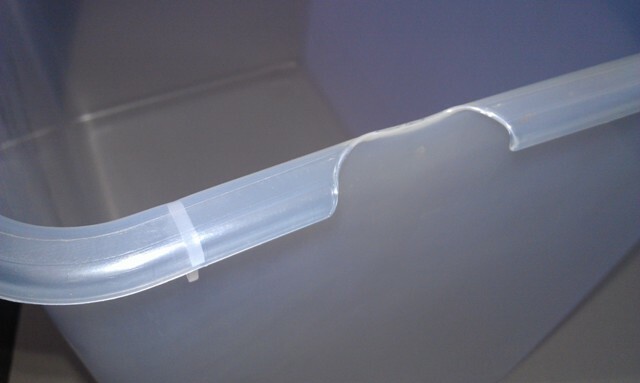 A plastic part is said to be short when the part is smaller than its normal shape. Shorts occur when plastic material does not completely fill the mould cavity. Eliminating shorts can have huge cost savings and should be part of a lean manufacturing program. But how to fix shorts shots? Isolating which area is causing the problem can be quite difficult so it must be done in a step by step procedure eliminating each possible cause one at a time. When doing injection molding troubleshooting, keep an open mind because the actual cause might be different to what you think it is. Explanation: A material with high viscosity is a lot more difficult to inject into a mould cavity than a material with a lower viscosity. Many things affect the viscosity of a material such as barrel temperature but the grade of plastic material used also plays a role. Melt flow index (MFI) is often used as a guide to measure the ease of flow but this does not give the full story. MFI tests are performed under low shear rates but injection moulding uses higher shear rates during the injection fill stage. Some materials behave differently under different shear rates so only use the MFI as a guide. Sometimes a high viscosity material (low MFI) can be beyond the capability of the machine -that is, the injection unit cannot generate enough injection pressure to fill the mould cavity. Action: Experiment with different grades of plastic materials with higher MFI which might make it easier for the molding machine to fill the mould cavity. Explanation: If short shots coincide with a new batch of material then it is likely that it is not exactly the same as the previous batch even though your sales representative told you it was. Action: a sample of the new batch needs to be checked against the previous batch of plastic material. Click here to learn how to do this. (opens in a new window). The first thing to do when shorting is an issue is to compare the current process parameters with past process parameters that were documented when quality parts were first produced. Action: Do a viscosity curve experiment as done in Scientific Molding by John Bozzelli. Explanation: A low injection pressure might be limiting the injection speed required to fill the mould cavity. If the injection speed is too low then the flow front of the plastic material in the mould cavity will become cool and solidify before it is full and create a short shot. Action: Increase injection pressure by 5%. If the part has improved then increase it another 5% until it is full. Explanation: If increasing the injection pressure does not make a full part or 95% of a full part then more injection speed is required. If the injection speed is too low then the flow front of the plastic material in the mould cavity will cool and become solid before it is full and create a short shot. Action: Increase injection speed by 5%. If the part has improved then increase it another 5% until it is full. Explanation: Low temperatures will allow the plastic material to solidify easier in the mould cavity. Action: There are 2 ways to increase the plastic material temperature. The first is to increase the barrel temperatures(check plastic manufacturers temperature processing range and increase to upper limit).If this does not fix the problem then increase the back pressure setting during the plastizing stage. Explanation: Excessive clamp tonnage will limit air escape (venting) during the injection stage. Action: Optimize clamp tonnage. In other words, reduce clamp tonnage until part quality is compromised. 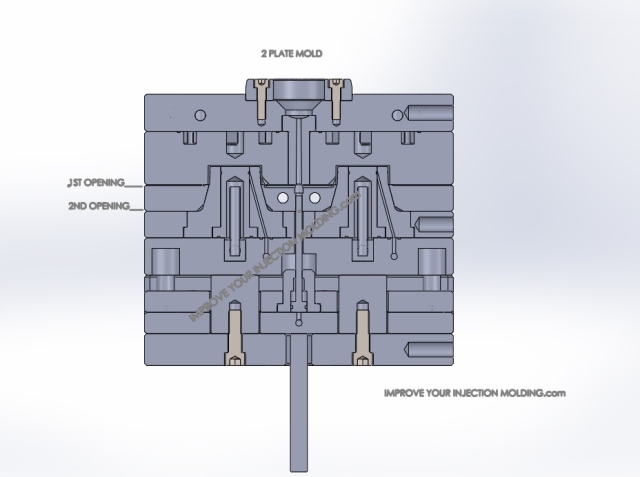 Single cavity moulds are easy to troubleshoot because there is only one cavity to investigate and the runner is short so it is a simple system to work with. However,multi-cavity moulds are more difficult because they are extremely sensitive to any type of faulty mould design or poor mold building such as small differences in wall thickness from cavity to cavity due to machining error. On top of this, multi-cavity moulds have a longer runner system than in single cavity moulds and shorting is often due to a fault in the runner system. Explanation: Uneven tie bar stretch will produce uneven clamp pressure on the mould. Assuming a symmetrical part is being molded such as a square lid, the short will occur on the side of the tie bar providing the most clamp. Note: it is important that the mould, plate or ring that is being clamped in the machine has been checked to be flat. If it is not it will give a false tie bar stretch. Explanation: During mould installation and removal, platens can be knocked about by the mould causing some impressions. These impressions have high spots around them which will cause the mould to clamp up unevenly. This uneven pressure can cause short shots. Explanation: Uneven wall thickness is a common reason for shorts due to part design. Uneven wall thickness puts uneven forces inside the mold cavity potentially forcing one side of the mold to open during the filling and hold phases of the molding process. Action: Increase clamp tonnage. If this is not possible then make the wall thickness even but this can be very costly and time consuming because both the part design and mould will need to be modified. What is the long term cost of not fixing them? Low cost mold manufacturers in Asia have been very popular with western plastic injection molding companies during the past 20 years. This behaviour has been primarily driven by the opportunity for OEM’s and injection molders to save up to 70% of mold price compared with locally made molds. In order to stay in business many western mold making companies have some form of cooperation with Chinese mold manufacturers. This has allowed them to offer lower mould prices to their local injection molding customers. Although the prices may not be as cheap as going directly to china, there are plenty of other advantages to using your local manufacturer. Your local mould maker takes all the risk and does all of the travelling. There is no requirement for you to spend time establishing a new relationship with people in a foreign country. That’s time you can spend running your business. Most importantly, you have the security to know that your local mold maker will repair the mold if anything goes wrong. Another way to source molds from China is to go and meet the Chinese manufacturers. If you make the effort to travel thousands of kilometres just to spend time with them in their factory and have dinner and do karaoke then this goes a long way in demonstrating to them that you are serious about business. Chinese like to become friends first before doing business. A genuine friendship will give you the highest possible chance of getting your mould project contractual requirements satisfied. The down side of this approach is that it requires a lot of travelling by one person in your company in order to maintain the relationship and to keep an eye on quality. Because you are dealing with a foreign company, it might be difficult to communicate all of your quality requirements at first, so you will need to keep talking to them to keep them on track. This is most effectively done face to face until you have done several projects together and you understand each other. This is the quickest and easiest way. Do a Google search on mold manufacturers and you will find many Chinese sites. The sites will allow you to upload your plastic part cad drawings so they can provide you with a quote. You can get a dozen quotes from a dozen different mold manufacturers with very little effort on your part with the option of choosing the lowest price. In a matter of weeks, a mold will be on your factory floor ready to go. This approach is highly risky however. The most obvious is quality control. How do you know the correct grade of steel has been used? After all, most steels look the same from the outside. The wrong grade of steel can quickly crack through water channels causing part rejects. To make matters worse you try fixing the crack by welding. At best, this method has a 50/50 chance of stopping the leak even if the welder uses the same steel as the mold steel. If he welds with different steel then the chance of sealing the crack and stopping the leak are extremely low. In fact, it will probably make the crack worse and now you have a mold that can only be used as a boat anchor. Getting the wrong grade of steel is the worst thing that can happen because it cannot be fixed. Now you know the consequences of buying the cheapest mold. Which approach is best? It depends upon your requirements. If plastic part quantity and quality is low then it makes sense to buy a cheap mould. However, if part quality and quantity requirement is high then you need a mould that will produce quality parts around the clock without any unscheduled down time. What ever you do, don’t let price be the driving force because you will pay for it one way or another. 3 plate mold designs are used in multi cavity cold runner mold tooling when a 2 plate mold design does not permit a suitable gate location. 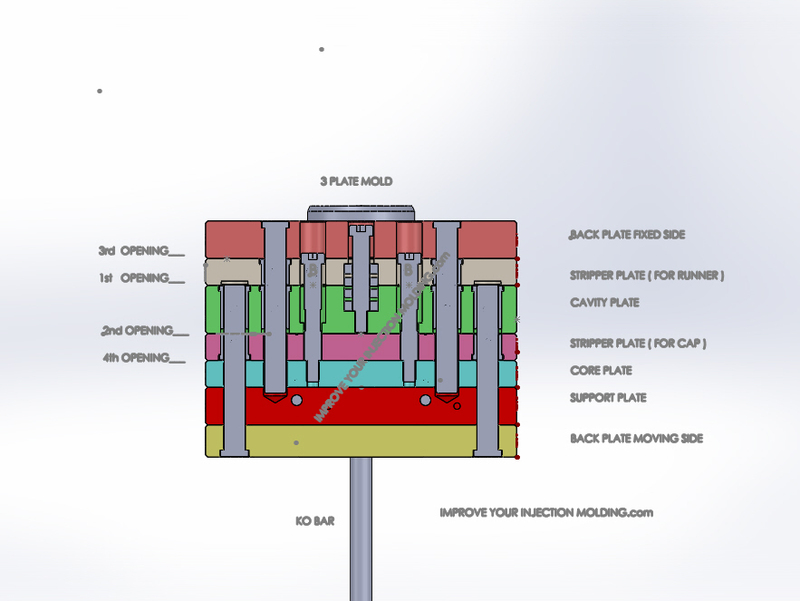 Figure 1 shows an assembly section of a three plate mold producing a 47mm cap. This design allows the gate to be placed on the top of each cap. The caps and cold runner are ejected by their own individual stripper plates during mold opening. Right click here to download Figure 1 in PDF format. If you want to open the file in your browser window, just click on the link (not all browsers have this feature). However, if you want to download the file to view later, then right-click on the link and choose “Save Target As” or “Save File As.” Then select where you want to save the file on your hard drive. During the opening sequence the first split is between the cavity plate and the stripper plate (for runner) due to spring pressure (see spring in figure 3) for the distance defined by limit screws (A) in figure 2. At this stage the runner is exposed but held firmly to the mold by the sucker pins (the sucker pins are labelled in Figure 1) . Right click here to download Figure 2 in PDF format. 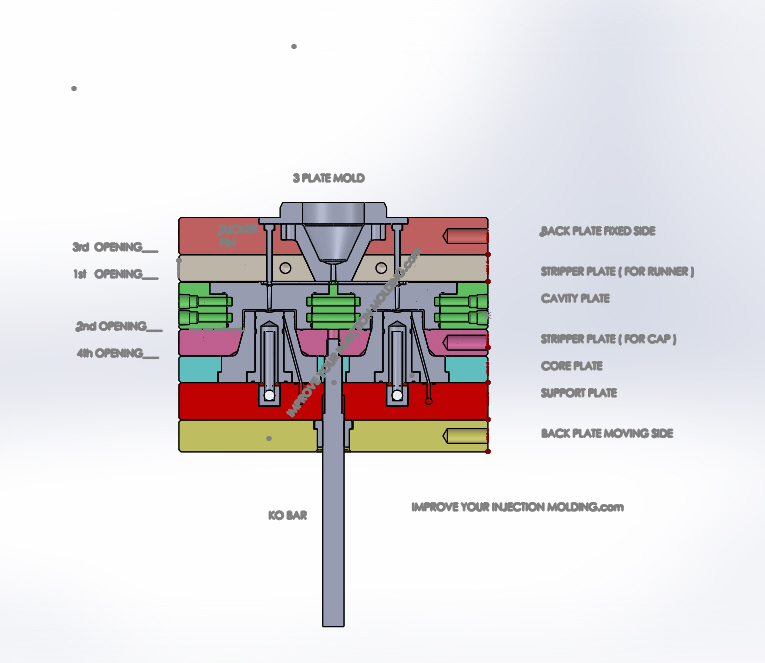 As the mold continues to open, the 2nd split is between the cavity plate and the stripper plate (for cap) for a distance defined by limit screws B in figure 3. Right click here to download Figure 3 in PDF format. The 3rd stage opening is between the back plate on the fixed side and the stripper plate (for runner) for a distance defined by limit screw (C) in Figure 4 which ejects the runner off the sucker pins. The runner falls to the ground. At this stage the mould is fully opened, so the KO bar must be initiated by the machine ejector to remove the caps from the mold tool which is the 4th. Should I Use a 3 Plate or 2 Plate Design For My Part? When designing a cold runner mold tool a 2 plate mold design should be considered first because it is easier and cheaper to make. One potential limitation of a 2 plate design is that the gate must come from the side of the part which has the potential to cause the following quality issues in some parts: weld lines, jetting, unfavourable shrinkage rates and wall thickness variation due to core shift in tall parts. Longer flow paths may also be required which can place higher demands on the injection molding machine and consume a lot more energy. Having said that, the 2 plate mold is suitable for many types of plastic parts. 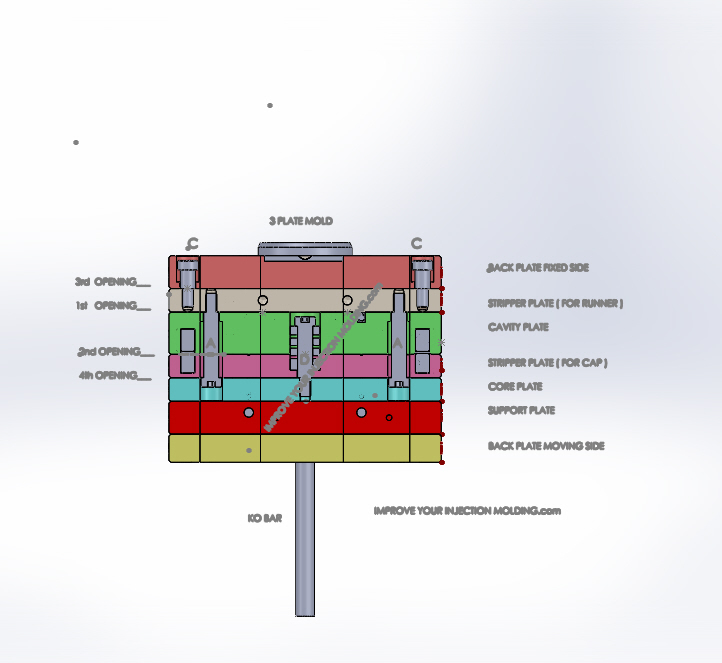 The advantage of a three plate mold design is that it permits the gates to be located on top or bottom of the part at any point on the surface. Well placed gates will produce quality parts every cycle. Figures 5 & 6 are an example of a 2 plate & a 3 plate mold design respectively for the same 47mm alcohol cap. Notice the different gate locations. Right click here to download Figure 5 in PDF format.